If you’re looking for a few casino promotions to help your week along then look no further than BeVictor Casino. 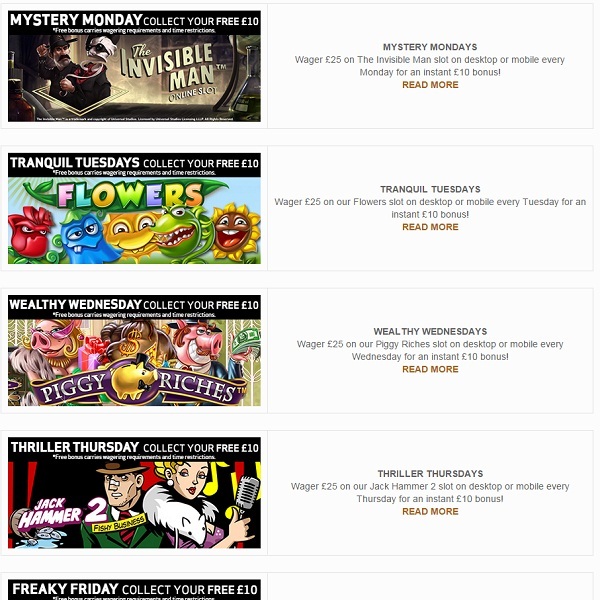 Every day of the week there are bonuses to be had for playing various different slot games. Simply bet £25 or more on the slot of the day and you will instantly receive a £10 bonus. The games are all available in mobile and desktop versions so each day there is plenty of opportunity to spin the reels. On Monday the game is The Invisible Man, on Tuesday it is Flowers, on Wednesday it is Piggy Riches, on Thursday it is Jack Hammer 2, on Friday it is Frankenstein, on Saturday it is South Park Reel Chaos and on Sunday it is Big Bang. All of these are extremely high quality slots so be sure not to miss out on this great bonus and have some fun discovering what the slots have to offer.